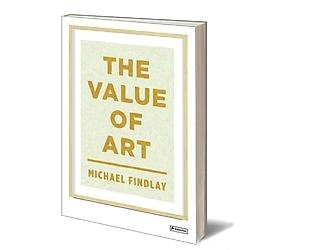 Seasoned art dealer Michael Findlay's book addresses head-on questions like, "Is art a good investment?" The Value of Art (due out in May from Prestel, $29.95 in hardcover) draws on Findlay's decades of experience as an art dealer, and contains many tales from his time as an insider. The Scottish-born Findlay is director of New York's Acquavella Galleries, known for exhibitions of 19th- and 20th-century masters such as Picasso, Braque, Rosenquist and Lucian Freud. He ran his own gallery in SoHo in the 1960s, showing artists such as John Baldessari, Stephen Mueller, Sean Scully and Hannah Wilke. He went on to Christie's, where he served as head of Impressionist and modern paintings. It was Findlay who was responsible for the famous sale of Vincent van Gogh's Portrait of Dr. Gachet, for $82,500,000. But Findlay doesn't want you to think about art only in terms of financial value. His book describes art's social value and tries to define, as well, what he calls its essential, or human value. BRIAN BOUCHER You point out that the profession of art dealer has only come into existence in the last 150 years. Do you ever stop yourself and remember that you're in a job your great-grandfather maybe couldn't have conceived of? MICHAEL FINDLAY It's really only so new in its present form. But there have always been people who have brokered deals for artists. Presumably Michelangelo had some form of agent. More striking than that, to me, is how very different being an art dealer is today from what it was when I entered the business. Dealers are more to the fore, although they were always a colorful part of the art world, if you think about people like Betty Parsons. But they were characters in an Off-Off-Broadway production rather than players on the world cultural stage. BOUCHER You point out possible future global shifts in the art market, led by the great growth in numbers of "high net worth individuals" in Asia, and the need for masterpieces to hang in the new art museums of the Middle East. What changes does that bring to the art trade? FINDLAY The volume of funds available is staggering, as well as the global nature of the art market. While there were for instance German manufacturing tycoons buying contemporary American art in the ‘60s, that was about as global as you got. Occasionally one or two prescient Japanese collectors were buying in Paris and New York. BOUCHER How is art collecting viewed differently today? FINDLAY It seems to me that the notion of collecting art as part of a lifestyle is new. It's integrated into a platform of multiple homes and a type of glamorized life. Whereas I think the collectors I became aware of when I entered this business led quite quiet lives, Bob and Ethel Scull notwithstanding. Not because of secrecy but because people weren't interested. BOUCHER You come down pretty hard on art investment funds, which are based on statistical surveys of auction sales, as unreliable indicators of the market. Why can't statistics be counted on if I want to strike it rich by buying and selling art? Statistics don't lie. FINDLAY Statistics don't lie but the statistics aren't available. They're fragmentary at best. Fifty-two percent of the art market is not conducted at public auction. So it's not known! And what happens at auction is often random—the reason something gets sold is often because of a death or divorce. So such-and-such artist is dominating the auction market, but that may be because several collectors who owned the artist's works all dropped dead at the same time! And hopefully every single work of art is different from every other single work of art. It has a different age, a different provenance, it could be the same series but it will have a slightly different history, be in a different condition. All these things plus the temperament of the buyer and seller at that moment in time make each transaction unique. I don't object to taking a very broad brush and looking at who at a certain moment is more or less popular. But to go to a neophyte collector and make them think you have a systematic way of determining how they should spend their money as an investment, I think it's ludicrous. BOUCHER You suggest that we practice looking at an individual work of art for one hour. How many people do you suppose will take you up on that? FINDLAY I teach a course at Christie's, and the students are told to look at a work of art for 15 minutes. Those who do five or 10 are doing well. I suggest it as a way of being extreme. The Louvre has clocked the average viewer at 10 seconds. If you come in somewhere over 10 seconds and under an hour, you're doing a pretty good job. An hour spent looking at one or a couple of pictures is more worthwhile than trudging around a museum until you're bleary-eyed, footsore and thirsty. I think we spend more time reading a novel or seeing a movie, and a work of art shouldn't be given such short thrift. BOUCHER Thoreau said that books should be read with as much care as the author took in writing them. FINDLAY I would say exactly the same thing about art. Even action paintings weren't made quickly. BOUCHER The social value of art, in your view, is illustrated by how often people get turned on to art because a cute boy asked them to a museum on a date. FINDLAY People kind of discount this aspect of art. Most of the time, people who are not fortunate enough to have good paintings in their home, the way they see great works of art is with or among other people. And that is very much part of the experience. It can enhance the experience if it involves mutual looking, discussion, exchanging points of view. It's not an experience that happens in a vacuum.